Normally I do my new Cavalcade Comics cover reveal in the “Greatest Hits” section of AWESOME-tober-fest but the cover I have for today fits the ghostly theme perfectly. 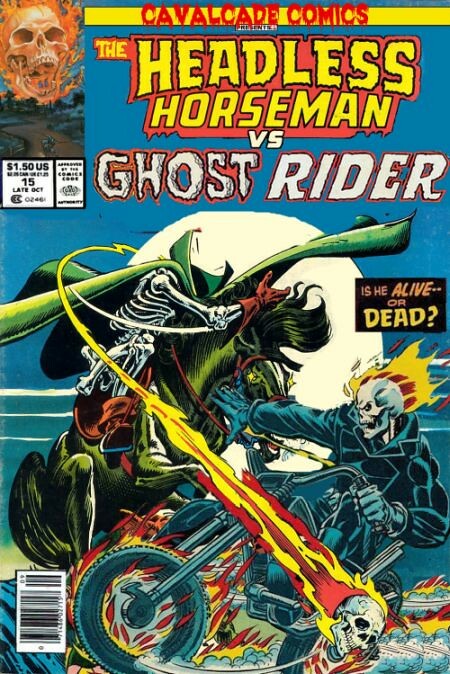 Today, the appropriately themed cover I have features The Headless Horseman vs Ghost Rider. I love this battle. Undead flaming skull vs undead flaming skull. Here are the covers that mostly make up the above. The Headless Horseman comes from Marvel anthology series Supernatural Thrillers, issue #6, 1973. As a matter of fact, this is the same anthology series that birthed The Living Mummy in issue #5, which I talked about last year. Ghost Rider comes from his own title, issue #5, 1974. April, 1974, to be precise, which means this very issue of Ghost Rider *could* have been on store shelves the day I was born in early May 1974. But it just as likely could have been issue #6 that was on shelves. Check back tomorrow for a ghostly movie review and the final “ghost” related article of the month! On Friday I talked about one of my favorite ghost movies, Peter Jackson’s The Frighteners from 1996. Well, as luck would have it, they released a movie novelization for it. It was written by Michael Jahn. So, I recorded a very special Halloween episode of I Read Movies all about this novelization. I talk about extra scenes, I talk about new plot points, there’s even a good bit explaining the nature of the movie’s ghosts. Lots of good stuff to hear, so either download the latest episode of I Read Movies on iTunes and Google Play or listen to it right here. Today I finally get to talk about The Frighteners by Peter Jackson starring Michael J Fox. I’m trying to remember how I first found out about/watched this movie. I’m fairly certain I did not see it in the theater as I would have been still in college and this particular movie wouldn’t have got me or my friends into the theater. Plus, I don’t actually remember it in the theater. I’m pretty sure I found out about it later. The draw for me would have been Michael J Fox in a horror comedy. I’m also fairly certain this would have been my first exposure to Peter Jackson as well. I probably caught it on DVD sometime in 1998 or 1999. And I loved it. The movie is about Frank Bannister, played by Michael J Fox. He can see ghosts. He uses this ability to fleece money from people as a “psychic investigator”. However Frank stumbles upon a rash of recent killings that look to be linked to a murder that happened decades earlier and he’ll need to use all of his supernatural skills to solve the murder before he becomes the next victim. That’s the basic synopsis. Lots more is going on here. Let’s take a look at the movie. This is the Bradley House. At one time it was Fairwater Hospital/Sanatorium. It was the site of the Bartlett/Bradley murders. Now it’s mostly closed and abandoned. The only people living here are Patricia Bradley and her mother. As I’ve already mentioned, I’m a big fan of this movie. I want you to know that upfront before I talk about the opening of the movie. The opening is a very exciting set piece within the Bradley house. We see Patricia being chased by a ghost that is materializing within the walls of the house. It’s a fast paced chase with some pretty great effects for 1996. And Patricia, played by Dee Wallace Stone, seems pretty terrified. Eventually the ghost materializes under the carpet on the stairs and grabs her just as her mother appears with a shotgun and blows away the part of the carpet where the ghost’s head would be. It’s a nice, thrilling beginning to the movie. However, once you get to the climax of the movie, it ultimately makes no sense. At all. Even Peter Jackson admits this opening is a cheat. It’s ostensibly one of the bigger problems with the movie, but honestly it never really bothered me. Easter Egg Alert! We learn some backstory about Patricia and her boyfriend, Johnny Bartlett, in a sequence featuring a “real crime” video one of the main characters is watching. This is the cover of the video. The picture of the couple on the left is supposed to be a photo of Kate Winslet and Melanie Lynskey as their characters in Jackson’s previous movie, Heavenly Creatures. Patricia’s mother the very next morning after the above opening sequence and she’s sporting a hairdo in what looks to be an unsubtle homage to Gary Oldman in Coppola’s Dracula which was only 4 years before this. Michael J Fox plays Frank Bannister. A man that has the ability to see and communicate with ghosts. As I mentioned he uses this ability to con people by working with ghosts to haunt houses so they have to hire him to “exorcise” the ghosts. Fox is pretty great as the lead. These are the ghosts that work with Frank; Cyrus and Stuart. Cyrus is a 70s disco gangster and he’s played by the great Chi McBride. Stuart is sort of a nerdy guy played by Jim Fyfe who, to me, is probably best known for hosting/producing those “Buy Me That!” series of PSAs about how commercials use camera trickery to make their products appear more attractive. This is another ghost working with Frank, “The Judge”. Judge is an Old West gunslinger/sheriff played by John Astin. He is sort of decrepit, his ectoplasm is drying up, and he has trouble keeping his jawbone in. Frank starts seeing spectral numbers carved into people’s heads. At first he thinks his ghost associates did it but we learn they didn’t. Great cameo by R Lee Ermey as Sgt Hiles. He protects the cemetery and is essentially playing his character from Full Metal Jacket. Here’s the ghost that Frank is up against. This ghost is killing people by appearing out of the walls and squeezing their hearts until they die. The Judge calls him the Soul Collector. Jeffrey Combs is excellent as Special Agent Dammers. Dammers is an expert in parapsychology. His work with cults has rendered him a bit…insane. At one point The Judge humps a mummy. “Dr Teeth” Jake Busey plays Johnny Bartlett with much scenery chewing. Those are just some of the highlights. Like I said, I quite adore this movie. Fox is great. I think, for the most part, the effects are great, especially for 1996. And it’s got this fun horror-comedy vibe that I just dig. The movie does pose several questions in the nature of it’s ghosts. One of the biggest issues I’ve had for years is that the ghost that’s committing the murders is WAY more powerful than ghosts like Stuart and Cyrus. As a matter of fact, Sgt Hiles also seems way more powerful than Stuart and Cyrus. Why is there a difference? Are there different classes of ghosts? What are the rules? The movie doesn’t really spell any of that out. For the most part, this lack of clarity doesn’t really hurt the movie, but those of us that have watched it many times can’t help but wonder what’s up. I acquired the movie novelization to The Frighteners which is written by Michael Jahn. I was hoping it would address some of my concerns. On Monday check out my review of said novelization on a brand new episode of I Read Movies where we’ll see if any of this ghost business is explained. Okay, so the last two episodes of The Real Ghostbusters I talked about (Take Two, Citizen Ghost) were super meta and attempted to deal with some issues of canon pertaining to the cartoons and the movie. They were fun and interesting episodes. Now, let’s take a look at a later episode that isn’t all “canon-y” and is just a cool episode that I had heard about but never seen. Season 4 Episode 2 – Flip Side. I forget where I first heard of this episode. I thought it was over on Shawn’s website when he was doing animation cels for Halloween several years ago. I could have sworn he had a Peoplebusters animation cel. The Peoplebusters are the ghost world version of the Ghostbusters. It was such an awesome concept that I’ve been wanting to watch the episode in which they were introduced for years. But I couldn’t find the animation cel on Shawn’s site, so maybe it was in the comments of an unrelated episode of the show. I’m not sure. This particular episode is during one of the later seasons where they changed the show name to Slimer and the Real Ghostbusters. In this episode the guys are taken via a dimensional storm to an alternate New York called Boo York, aka The Big Pumpkin. It’s a flip universe populated by ghosts. The guys go to their headquarters to figure out what’s going on and see things are very different. I love that the Peoplebusters sign has Egon in the cross bar. The guys walk into the building and they run into this universe’s version of themselves…The Peoplebusters! Yes! Ghosts who hunt people! I’ve always loved the idea of antagonists that are the reverse of the protagonists. Sherlock Holmes/Moriarty. Flash/Reverse Flash. Ghostbusters/Peoplebusters. I love it. Since the Ghostbusters are humans in the ghost world, they seem to have all the abilities that ghosts do in our world. The very first of which is, they can fly. The guys spend the episode learning about being people in a ghost world all while being chased by the Peoplebusters. Here’s the containment unit the Peoplebusters use. It’s a giant awesome metal skull that “eats” the humans. This is the Peoplebuster’s Ecto-1. And I think it’s kind of badass. The Ghostbusters really need to take notes on this one. It’s like a Mad Max vehicle raped a Batmobile. Not only is this a very good episode, the visual design of the alternate Boo York is superb. I highly recommend watching this episode if you haven’t.